Kevelaerer Blatt successfully turned from stopping work to growth in one year – and just kept going from there on, also thanks to LaterPay. The Kevelaerer Blatt is the oldest documented local newspaper on the Lower Rhine region. The local weekly paper appears for 27. 553 inhabitants of the pilgrimage town of Kevelaer in the district Cleve on the Lower Rhine. "Kävels Bläche" appears on Thursdays expenditure for print with an extent of 16 pages. In 2008 the Funk media group acquired the publishing company rights, however, separated from the small traditional sheet in April 2016 on account of stagnant edition figures and sold it to the Mega Top Verwaltungs GmbH under direction of the Kevelaer businessman Rudolf Beerden. With his assumption of office in April, 2016 publisher and editor Rudolf Beerden summed up the challenges for the Kevelaerer Blatt: Subscriber numbers sink in all media, also the announcement business in the local print and online publishing is falling. The competition for a few readers has led for decades to an increasing newspaper dying and to one-newspaper circles. The challenge was even greater for the Kevelaerer Blatt, not only to defend itself against a local advertisement, but also against the local edition of the Rheinische Post. The Kevelaerer Blatt appears weekly on Thursday, in 2016 still with a circumference of 12 pages. After the takeover, publisher Rudolf Beerden mainly changed the layout, designed it with 30 percent less text and set the editorial focus on the local reference. Rudolf Beerden also wanted to adjust the online area to the needs of his readers. "The Kevelaerer sheet has always been a local paper, that's our brand core. And we also wanted to expand this brand core online with a stronger local reference, "says Rudolf Beerden. However, unlike than the weekly paper, the online area should become more topical. Since April 2016, the editors published on kevelaerer-blatt.de daily updates in large numbers. And if contributions from the weekly paper were previously secondarily used primarily online, they appear online since the reorientation daily and then find their place in the weekly edition bundled. At the same time, Beerden said goodbye to his free offer in April 2016: "The Kevelaerer Blatt offers its readers a lot of local added value. At the same time, as all regional media know, advertising is not a guaranteed source of revenue that a digital service can carry by itself. Our readers understand this and support us. "That’s why the Kevelaerer Blatt integrated with the acquisition by Rudolf Beerden the payment technology LaterPay. 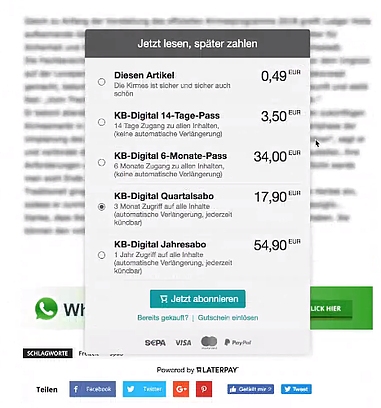 With LaterPay the Kevelaerer Blatt is able to offer his readers a variety of purchase options that would not have been permitted by an hard subscription paywall. In the meantime, the local medium now offers five different payment options geared to user needs: the purchase of a single item, which is collected by LaterPay for a value of EUR 5 and then paid, a 14-day passport, a 6-month passport and two Subscriptions that are settled either quarterly or annually. When buying individual items, the Kevelaerer Blatt also showed experimentation - the price of a contribution is set by the editorial staff depending on the amount of research and depth as well as exclusivity. For the dialogue with its readers as well as a sales push for single articles online the medium set also on Facebook marketing. Unlike many other publishers, the Kevelaerer Blatt did not use any contributions as an instant article on Facebook, but always kept it on its own page and used the social network as a feedback channel for the readers. In the past two years, the Kevelaerer Blatt increased its print subscriptions by 7 percent (YoY). After two years, Kaevelerer Blatt also achieved online success with this new content strategy, which is otherwise atypical for local media. The fact that content can only be retrieved cost-effectively, therefore, did not lead to a decrease in page views. On the contrary: in 2017 and 2018, the Kevelaerer Blatt each recorded a revenue growth of 300 percent (YoY). In Q1 / 2018 alone, the purchase volume of individual items increased by 100 percent compared to Q4 / 2017. When buying a single item also shows that the individual pricing is well accepted by the users: Thus, the most successful articles consistently reached a large number of sales, regardless of whether it was a contribution for 49 cents or 1.99 euros. Rudolf Beerden confirms: "We maintain an intensive exchange with our readers and understand which articles are worth more to them than others. They reward the effort we put into each individual post, fair. " The decision to provide print content online even before the weekly newspaper was published turned out to be smart. Looking at the lifespan of the articles, most online purchases are made on the day of publication and a contribution generates an average of up to seven days of sales. Not only are readers ready to leave more money with the publisher. Once you realize that online editors keep their brand promises of up-to-date, local news and provide them with informational value in everyday life, many opt for the longer-term payment options in the LaterPay package. Thus, the annual subscription was about ten times more completed than the quarterly subscription, also for the 6-month passport more readers decided than for the two-week equivalent. Rudolf Beerden, publisher and editor, Kevelaerer Blatt: "We have actually managed to grow strongly in two years, both in print and online. At a time when newspaper buying and digital sales are stagnating at many publishers, I am very proud of it. We also owe this success to our readers who are looking for an exchange with us and who consider us as part of the community to be sustained. " "The Kevelaerer sheet proves that the myth of free culture on the internet is just that. A myth, "confirms Cosmin Ene, CEO of LaterPay. "In the two years since the company was acquired, Rudolf Beerden has proven that with a focus on brand values, openness to readers and a departure from 'We've always done it like that' content models like the hard paywall or free content is actually growth possible. And that with a local medium in one of the last multi-newspaper circles in this republic. That's outstanding "